A trio of successes along the road to serving customers' best interests. Minale Tattersfield’s first milestone achievement for Lukoil came in 1999 after advising against the use of the black oil drop which spoke only about the negative aspects of the oil industry and nothing about the customer focused aspirational values that Lukoil would need in order to be successful in retail. The second achievement came in developing a differentiated architecture that would help Lukoil maintain a leading position in the Russian retail fuel sector and further reinforce the Lukoil brand on the international stage. The third achievement came in winning the pitch to design a state of the art shop that by 2011 was in great need of modernization having been omitted from the 1999 contract. Minale Tattersfield has worked with Lukoil for a number of years, our most recent involvement reflects experimental work to amplify the cleaner, less oil-driven side of its business by creating a state-of-the art customer offer and broadening the brand’s appeal beyond fuel to include a food component. The Prague-Barrandov prototype site required a new Look branded c-store design. The design would play an integral role in Lukoil’s future retail strategy to reach its market potential in the non-fuel convenience sector. Our involvement would include 360 design and technical specification of the c-store interiors, forecourt signage and an integrated branding solution that covers the entire forecourt and building, store interior and even staff uniform. 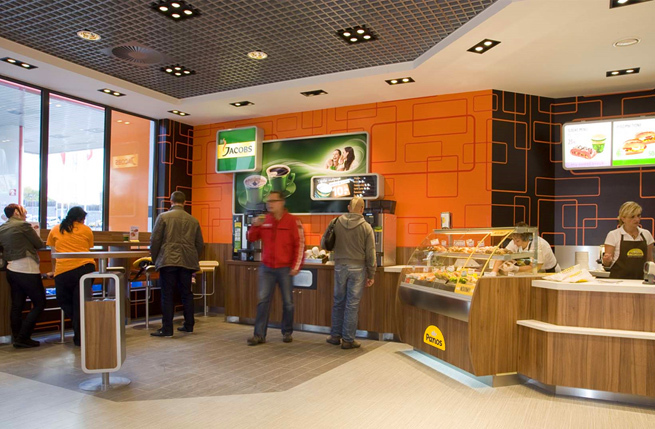 The Prague-Barrandov design responds to Lukoil’s brief to totally modernise the c-store interior of their shops to create a customer offer with a strong focus on own-brand and partner-branded food-to-go and self-serve coffee, as well as tie-in 3rd party grocery offers. Functionally, the new design had to be easy to maintain and to implement across a wide and diverse international network. To enhance the in-store ambience and ensure a high level of comfort, the design paid careful consideration to seat layout and positioning of dividers to reduce noise and manage in-store traffic flow. Additionally, interior decoration and in-store branding was finely-tuned to create a comfortable non-supermarket ambience and to encourage customers to take additional time to relax. Whilst Minale Tattersfield were trying to replicate the pleasure of a traditional shopping experience, they were also keen to avoid clutter and confusion that has become much the norm in many c-stores today so that customers can see at a glance where everything is situated. Clear back illuminated signage helps reinforce clarity. Text and icon messages are deliberately simple and informal to appeal to young and old alike. 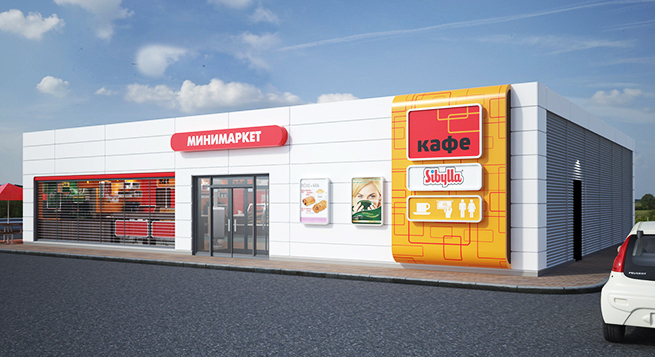 If Lukoil is to reach a position where it can successfully loose the 'o' droplet in its logo, it must first serve the customer's best interest and this is exactly what the latest c-store is aims to achieve. Additionally, in approving 3rd party in-store branding, Lukoil is opening itself to new advertisers, and long-term this should benefit customers with improved choice and diversity. So far, a new build site at Vnukovo in Moscow, and retrofit prototype at this site in Barrandov, Prague has been built. Trading is up 15% at the time of writing according to Lukoil.